Seyra @ the 2015 10th Anniversary of Hacienda Luisita Massacre. Remembering the prior 7 activists that were killed, and the hundreds that were injured. Every now and then I have the absolute pleasure of meeting a fellow blogger that is just as into social activism and fashion as I am. For a multitude of reasons I rarely meet women that are just as passionate about both - and when I do I make sure to keep these individuals around me. Creatively gifted, into style and not standing for intolerance and injustice in the world that perpetuates it, is a significant sign of a person I want in my life! The first contact I had with Seyra, of Pavements are Runways was through a comment she left on one of my blog posts, "Are you as into fashion and social activism as I am? I have never met another blogger with these same passions!" A friendship was born. 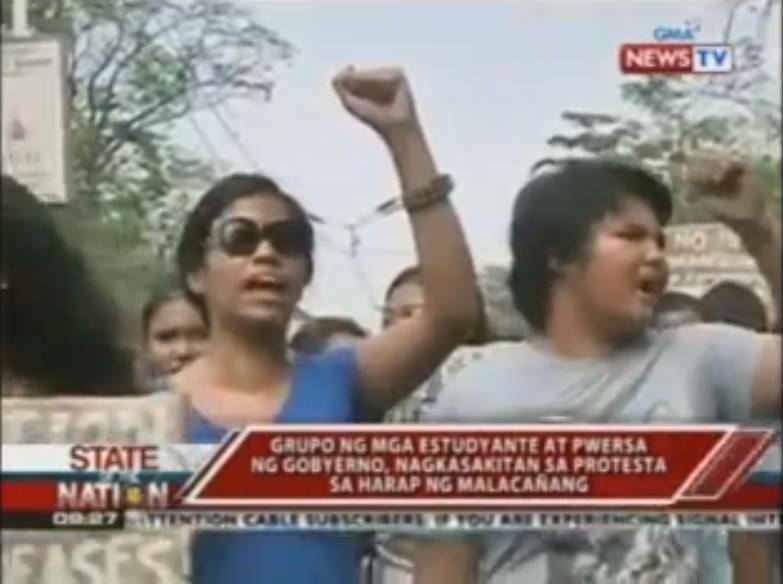 Currently, Seyra works full-time for GABRIELA, the only militant organization for women in the Philippines. Seyra's story is one I felt extremely relevant in terms of sharing because it shows a side of The Philippines that many of us do not know, or experience. The media prefers to keep the real issues silent, and thanks to Seyra we can all become not only more aware, but more inspired. The above photos represent raising awareness for "International Working Women's Day 2015". Anyone who knows me, knows that women's rights is a cause I would go to the ends of the earth for. A lot of American women take for granted the access we have to an education and desirable career path. Many countries around the world restrict these basic human rights based solely on gender. Incredible women like Seyra, are fighting for our rights and raising awareness in a very real and meaningful way. Please read the below essay Seyra wrote for me, it might just change your perspective on a lot of things, it certainly did for me. I’m Seyra Rico, and I’m a full time activist and fashion blogger. I work for International Relations Department of GABRIELA, the only militant organization for women in the Philippines. I became a full time activist after I finished my undergraduate degree. I tried to looking for a typical full-time position, but realized that I didn’t want to be a corporate slave. How could I go about my daily life when I knew about all of these issues? I felt a calling to help. I cannot be depoliticized. I chose to be a full time activist because I can’t sit around, doing nothing while knowing about all the injustices happening in my country. GABRIELA is part of the International Women’s Alliance, a worldwide alliance of anti-imperialist women organizations. Bringing it back, for everyone to know why I choose this path, we need to historicize it. It was July 2013, my first mobilization--during the fourth State of the Nation Address of President Aquino, which is probably the most passionate rally every year for the national democratic movement in the Phillipines. It was an assertion rally, for we wanted to get closer to the venue, but hundreds of police force, and even the military was deployed for that event. The result were cracked skulls, dripping blood and lost shoes afterwards. For every mobilization, we have a buddy system, wherein you will always have a partner or buddy. This buddy goes with you everywhere no matter what. My buddy and I almost got hit with the policemen’s truncheons because we tried to protect the injured activists and medical team assisting them. Shortly afterward, my friend got arrested when he was picking up his glasses. We formed a quick response team and did an indignation rally on the detainment place. About a hundred police officers forced us to disperse using their shields and truncheons. As if that wasn’t bad enough, the police continued to chase us for more than 1 km. Going as far as entering a fast food chain that people in our group went into. I was crying so hard afterwards because I couldn’t believe that the state I live in was capable of such violent acts. Especially when their mandate is to “serve and protect,” the people. None of the activists were armed, we were carrying placards and our desire for genuine social change; but the police continued their merciless tactics. Yes, I’ve seen violent rallies on television, but it never seemed real prior to that day. I was inconsolable afterwards, this experience had changed me. This was the start and reaffirmed my belief that freedom isn’t free. I now plan to dedicate my life fighting for freedom and equality. 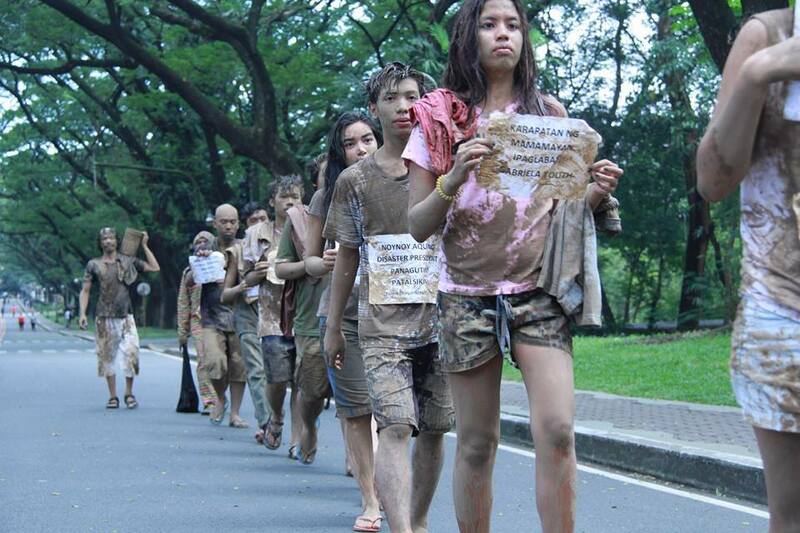 Being an activist in the Philippines is no easy task. This is an extremely dangerous country for journalists, maybe even one of the worst. That’s what happens when you want the truth exposed. In my line of work I deal with endless contradictions on a daily basis, and activists see the brunt of it all. We don’t have salaries, only allowances to get us through. Yet, we adhere to a philosophy of tireless persuasion and simple living. This means our primary goals in life are not lavish. We stay strong, never getting discouraged in speaking out to the Philippine people, mobilizing and organizing them to fight for their rights. Everyday, I am inspired. This happens in the simplest of ways. At times I am merely listening to news, or talking to the victims of human rights violations. I distinctly remember once speaking with a mother of a desaparacido (activist who had disappeared, and she was recounting how the army came to her home and demanded their activist son. They didn’t find him, so instead they took her non-activist son. He was never seen found again. It’s just terrible. More recently, I have been moved by the Lumad issue. This is an issue where hundreds of indigenous people are harassed, displaced and killed because their ancestral lands are rich in minerals. It is the state, the military and the transnational companies with private armies that are doing this. This needs to stop. As you can see Seyra is an inspiring woman. Not everyone can be a full-time activist, but everyone can be a part-time one. There are so many causes out there begging for change and one person truly can make a difference. The next time you forget that, remember my wcw, Seyra Rico. Want to keep up with her on a more regular basis? I'M STILL NEW TO BLOGLOVIN' SO IF YOU LIKE WHAT YOU SAW HERE.. GIVE ME A FOLLOW!